Hart Water Ltd - Household Water Treatment based in Haverhill, Suffolk. Invoice history based on 669 reviews. WE ARE A COMPLETELY INDEPENDENT WATER SOFTENER SPECIALIST. Hello, and thank you for taking time out to look at my profile. Thank you for looking at this page. Hart water was started in March 2012 by my wife and I. I had previously worked for a water softener firm for over twelve years. We are completely independent unlike many other water softener companies. We sell three of the leading water softener brands which are Ecowater, Harvey's and Nuwave. I always explain the differences between all the softeners and recommend the right softener for your specific needs. We do not push you to one particular brand but let you decide for yourselves. We were made an Ecowater premiere dealer in 2013 and are one of only six dealers for them in the country. We cover all of Suffolk, Norfolk, Essex and Cambridgeshire. When you contact Hart Water you will either speak to Jackie, Adrian or our son Jack, we do not employ anyone else so Adrian deals with you from start to finish. 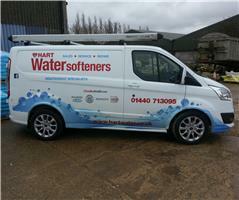 Adrian and Jack complete all of the installation work, delivers the salt and services and repairs water softeners. We have a Facebook page with a lot more photos of our work so please have a look. Since we have been trading we have built up an impressive number of customers and will be looking to carry on supporting customers both new and existing. We answer the phone seven days a week and are not nine till five. If you need us just give us a call. Training as an engineer, he goes to college three days a week on a plumbing course.